The cooler weather has finally moved into my part of Texas (even if it’s only for a few days here and there–I know it will be here for good soon!) so it’s starting to feel a little more like fall. My weekly menu plan this week sort of reflects that with some yummy comfort food. At least comfort food for us. I’m keeping it simple. Here it is! Last week and this week, I’ve paired up with a couple of blogging friends of mine to share some great content. Ellen Delap, a professional organizer, rounded up favorite tips from other bloggers on how to get organized for the holidays. They’ll be here sooner than you think so take a look here for my tip and others to get you started! And tomorrow my Homemade Slowcooker Spaghetti Sauce that I’m making on Monday will be featured on the VineSleuthUncorked website where they’ve taken my recipe and paired them with a few wine selections. Check it out here! What’s on your menu this week? For more ideas check out OrgJunkie. 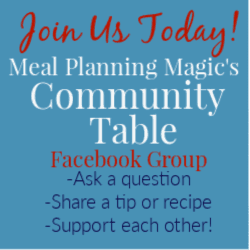 Don’t want to miss a new weekly menu plan? Be sure to SIGN UP HERE to receive updates via email or RSS feed (you can choose the reader you prefer!) And don’t forget you can always follow me on Facebook, Twitter, Pinterest or Instagram. They all offer a little something different and are a great way to stay in the loop on new menu plans, recipe ideas, giveaways, organizing tips and more!